Artificial grass offers a number of benefits for Arizona homeowners. You don’t have to endlessly water it to keep it green in the Arizona heat. You don’t have to mow, aerate, fertilize, and seed it. You don’t have to spend hundreds of dollars and hours tending it and keeping it looking good. So many bugs live in your yard because there are things like dirt, grass leaves, and other bugs to eat. Pests like moles, voles, and shrews take up shop because there is a bug bonanza in your front yard. Then the rattlesnakes slither in because there are nice rodents on the buffet. Installing artificial grass in Mesa won’t completely get rid of the organic matter or even the bugs that are so tasty for so many pests, but it will significantly reduce them to the point that your yard won’t be as attractive to a wide variety of pests. You might still things like ants in your yard, but you aren’t as likely to see snakes, rats, voles, or other pests in the yard. Leaf piles, stacks of branches, and other organic clutter has a way of adding up in a yard. It all gets lumped in with yard maintenance, which can feel like much more of a chore when you have a lawn to tend. But when you have synthetic grass and you get rid of chores like mowing and aerating, you suddenly feel more energized to blow away leaves and keep your yard looking beautiful and green. Without that organic clutter, pests like scorpions, termites, and ticks are much less likely to hang around. They don’t have the nesting space that they like, so they’ll look for it elsewhere – farther from your home. That will save you money on pest control near Mesa and give you peace of mind. Standing water is a huge attraction for bugs and other pests. If you aren’t properly aerating your lawn, or if any part of it is in the shade, water is likely to pool before it drains. Artificial turf near Mesa is installed over a layer of gravel and fill material for drainage. Rain, pet waste, and other liquids fall through the turf and into the drainage layer. You won’t have any standing water in your yard, which will make it a lot less attractive for pests. You’ll really notice the difference during the Arizona monsoon season. Your yard is a breeding ground for dust, cobwebs, insect eggs, and much more. You can’t do much about that except spray is down with chemical pesticides regularly. But with synthetic grass, all you have to do to keep it clean is spray it down periodically. During the rainy season, you don’t even have to do that. Mother Nature does all the work for you. Getting rid of all that dust and other detritus makes your yard less hospitable to pests. Though it has many benefits, artificial grass won’t make your home pest-resistant. You will still need to get regular inspections from an exterminator and have a plan for ongoing Mesa pest control. However, the synthetic grass will make your yard and your home less attractive to pests, which means you’ll be calling the exterminator much less. You will save a lot of money, and you can feel more comfortable in your home knowing that you and your family are its only inhabitants. 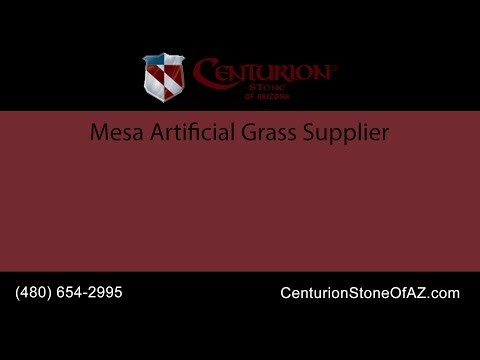 Centurion Stone of Arizona can help you get the beautiful yard you crave all year long with our high-quality artificial grass near Mesa. We install our synthetic grass over a drainage layer that ensures that you have no standing water in your yard that will become a breeding pool for pests. You’ll have a beautiful lawn that will set the perfect stage for entertaining at any time of year. Stop xeriscaping and give yourself a lush, full lawn instead. Call us in Arizona today to get an estimate for artificial grass for your home or business.